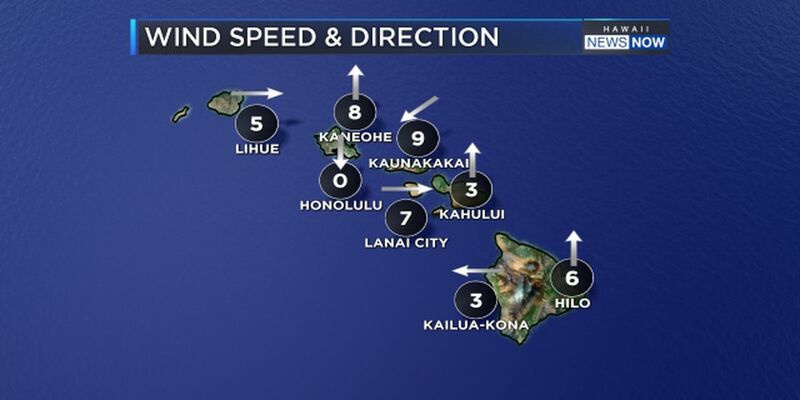 Winds have become light and variable over the Hawaiian islands. A weak cold front to the northwest of the state has pushed a ridge of high pressure closer to the islands, resulting in a very light southeast wind flow. Winds will be light enough almost all week to allow for daytime sea breezes with afternoon clouds and interior showers. The front is forecast to stall just short of Kauai as it runs into the high pressure ridge. For now, there could be an increase in clouds and maybe showers Monday, mainly for the Garden Isle. Heads for up for a celestial show this evening! A total lunar eclipse will be visible (clouds permitting) in eastern skies, as a full supermoon rises at about 6:07 p.m. Greatest totality (when the moon is in the deepest of Earth’s shadow) will be at 7:12 p.m, causing a blood red moon from light refracted in Earth’s atmosphere. Surf is small for the weekend, but north and west shores will get a boost Monday and continue to rise, possibly to advisory levels, by Tuesday night. Overlapping swells could push wave heights to warning levels Wednesday and Thursday. For mariners, a small craft advisory is up for most Hawaiian coastal waters around Maui and the Big Island.